Down 4-1 at the half, the Bulldog soccer team was looking for a tourniquet in the form of a defensive stand Saturday at the Mack Chase Athletic Complex. Unfortunately, one was not forthcoming. 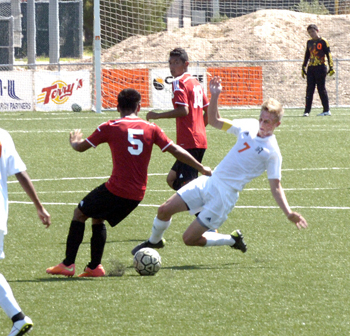 The Jaguars of Valencia continued their offensive onslaught virtually unabated in the final 40 minutes to post a 9-1 victory that, along with their Aug. 25 loss to Hobbs, the boys in orange can do little with but learn from and forget. “We have to keep our composure when we get scored on,” Artesia head coach Phillip Jowers said Saturday. Letting frustration lower their guard was definitely the primary malfunction for the ‘Dogs, who had swung the momentum their way at the start. After a quick attempt by Artesia just over two minutes in that was blocked, the two squads went back and forth until the 12th minute, when Cesar Romero found the back of the net to give the Bulldogs a 1-0 lead. The Jags wasted no time responding, however, appearing offsides but dashing through the no-call to knot the game at 1-all with 26:43 to go in the half. From there, the ‘Dogs seemed off balance, and Valencia took full advantage, scoring again just over one minute later, notching their third goal at the 15:50 mark, and setting the halftime score, 4-1, on a shot off a free kick with 3:29 on the clock. What air Artesia took the field with for the second 40 was quickly let out when the Jaguars popped a header over the keeper to make it 5-1 just over three minutes in. The ‘Dogs were able to fend them off for the next 20, including a nice save by goalie Aaron Natera, but with just under 17 minutes left to play, Valencia put the hammer down. The Jags scored at the 16:54, 12:38 and 9:57 marks and again on an open net after getting behind Natera with under two minutes to play to run away with the game, 9-1. The ‘Dogs (1-2) will have just one day of light practice to put the loss out of their heads before hosting NMMI at 6 p.m. Tuesday, but Jowers will be stressing the mind-over-matter approach.